Rocks are the foundation of our level, in both the cave and the forest areas. As the forest area is my primary concern, when I started these rocks it was specifically for that area- hence why most are flat, as they are meant to be by a river, so I was trying to implicate the smoothing effect the water has had on the rocks to an extent. 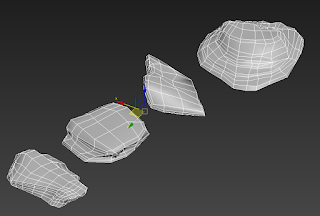 My intention was to do another set of rounder, rougher rocks for the cave, however the learning process took longer than expected so unless I get more time later, these rocks will be used for both. I think there is enough variance in shape to support that at least. I started in 3ds Max, unsure of our polycount aim or budget, so I started relatively low. On reflection, the original models were never going to be enough to supplicate the quantity and size these rocks needed to be, as well as how often they would appear in the level to not justify a much higher poly count. Regardless I didn't realize my error until far later. I modeled my rocks so they had a different shape on each side of the rock, so when it decorating the level, you effectively had 4 times as many rocks, also with the intention that you could stretch the shape and rescale things for even more variance, When I started sculpting some detail for a quick bake, I got quickly carried away with the detail. It was a internal conflict to make the rocks as beautiful and detailed as possible without breaking the original shape of the model. Otherwise it wouldn't bake. What I got was an ugly hybrid. I was too carried away with the sculpting that I broke the original shape too much that the normal maps didn't work. It also occurred to me how much potential they had, and how satisfying and easy it was to model rocks in zbrush. I instantly felt that my new sculpted rocks were wasted on their original models. 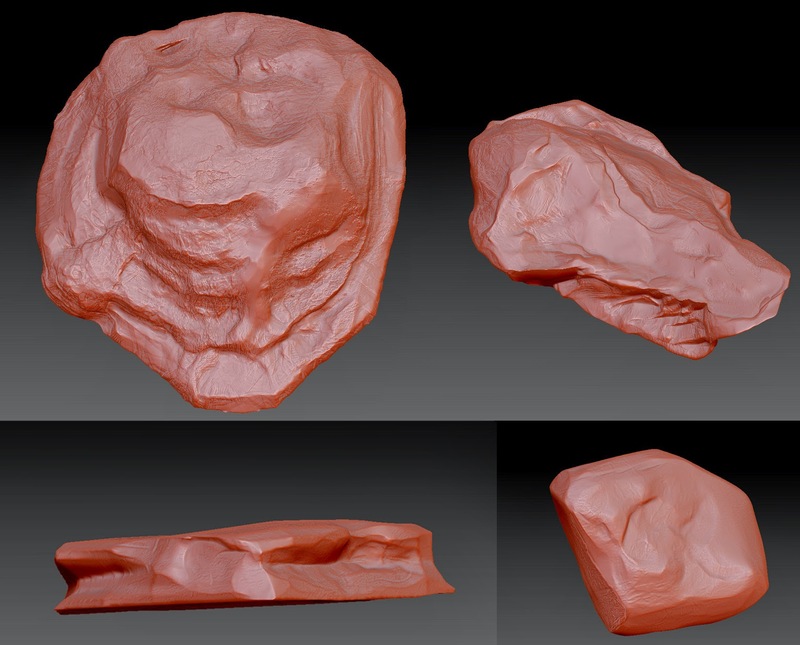 I've been looking into re-topology software/retpoloising in zbrush so that maybe I could recreate my rocks based on the sculpt, and rebake based on that.